Posted on September 18, 2016	by Gary M. Jordan Ph.D.
That familiar feeling started growing in my gut, and I said to myself, “Here we go again.” The ‘here’, where I have been countless times, is on the receiving end of a lesson in marketing that I knew would not work for me. You’ve probably received the same type of lessons or advice too. The hope that someone can teach you how to market yourself, your products, and your services without you having to do any of the work yourself. The belief on the part of the speaker that what has worked for them will work for you if you just do exactly what they did. The deceptive simplicity of the steps prescribed that are indeed simple for someone who has the natural skills to do them. But are those your natural skills too? The oh so popular misconception that any failure with the simple steps of others is totally do to your lack of desire, which keeps you frustrated and/or depressed. Marketing is not a simple process. It requires focus, a fair degree of understanding of yourself, your product, and your potential market, and the awareness and flexibility to adjust and re-work as circumstances require. Simply put, there is no “one size fits all”, unalterable way to successfully market that works for everyone. I cannot tell you how many times I have encountered people who, being successful marketers, want to share or sell me their ‘sure fire’ way to market. Each and every attempt to copy someone else ends in disaster and a sense of failure. I used to beat myself up after every failure because obviously I hadn’t ‘done it right’, or I didn’t ‘get it’, or worst of all because I didn’t ‘really want’ to learn and succeed. But I discovered that everyone is capable of learning how to market successfully. Really. With comfort and ease. And it’s not a matter of copying someone else’s success – that rarely works. Successful marketing requires that you know your natural marketing style. Each style will find success with different approaches, forums, potential markets, and methods. Without knowing your style, finding what works naturally for you is hit and miss. Your natural marketing style is an aspect of your Perceptual Style. 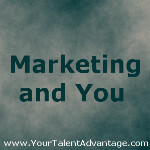 To find out how to discover both you can visit our website at www.yourtalentadvantage.com. This entry was posted in Entrepreneurs and tagged business marketing, difficulty marketing, how to market your business, marketing style, types of marketing. Bookmark the permalink.